Welcome back to Day 3 of our series on building your Home Management Binder. 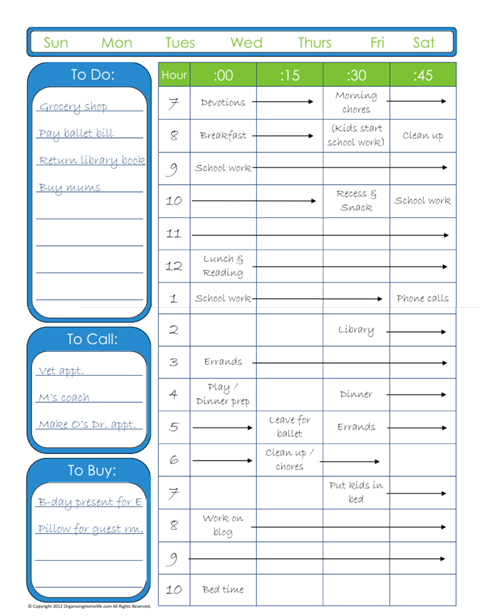 Today’s printable is a To Do List with a Daily Time Schedule. I am such a list oriented person, and this is my most favorite way to organize my time! I made a sample for you to show you how it works. 1. First, I write down everything that I know I need to do, buy, or calls I have to make that day. 2. Next, I fill out the time schedule with things I know are not flexible like ballet lessons and school time (I homeschool my kids, so I have to plan it in :)). 3. After the “essentials” are filled in, I begin to plan out the things on my to do list. I try to estimate the time each item on my list will take as best as I can. Sometimes, it doesn’t work out like you plan, but that’s life! Roll with the punches and adjust your schedule. Now, just so you don’t think my life is perfect (because it’s not! :)), this is a sample, intended to show you how to use it. Our schedule flexes every day, and some days it’s hard to keep a schedule at all! However, I find that when I plan out the things I know I need to get done by assigning a time to them, I am much more productive than if I just write an unending “to do” list. To download the To Do List, click on the image below. A .pdf file will open in another screen. P.S. 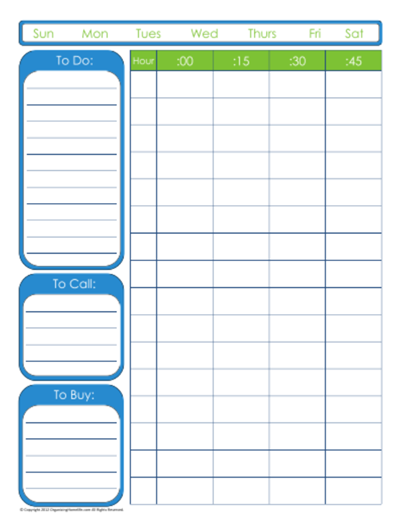 A little tip to keep you from having to print this out a zillion times: Print out one for each day of the week, put them each in a plastic page protector, and write on the plastic with a dry erase marker. Click on the BLANK image to download the file (not the sample image). omg – if you were here in front of me i would kiss you!!! like i said yesterday, i am re-vamping our entire household system b/c mommy forgot a few things last week. this schedule is awesome! can’t wait to give it a try. thank you!!!! Oh my goodness, Ginny, I want to kiss you! I know that we are only 3 days into building our home management binder, but this page alone takes the proverbial cake!!!! I am the reigning Queen of To Do Lists that get scribbled everywhere and sometimes fed into my iPhone. Some weeks, I will be working on multiple lists and other weeks I consolidate them to one list. Sometimes, they are chicken scratch, other weeks, you’d think I taught penmanship they are written so neatly. Thank you, thank you, thank you!!! <yes, I completely realize the level of dorkiness I have achieved —- some people knit, run ultimate marathons, play the guitar … my talent/hobby that I continue to feed/foster is called "Ultimate Organizing". Ha – it looks like I am not the only one that wants to kiss you! That should make your day! Thanks, again! I have been looking everywhere for a daily schedule like this! Tried it today and I think I need some practice estimating how much time something will take me but I know in the long run this will be a huge help. Thank you so much for posting!!!! Thanks for sharing your household binder, this will help me revamp mine. And many thanks for this to do list, it is so much better than mine. Although I’m not sure i will be able to keep it up since DH doesn’t really follow any schedule and scraps mine all the time. Really looking forward to see the rest of your stuff. This is an awesome day planner! I just printed one out to help me get my work day planned. I waste far too much time at the office. I think this is just the ticket I need! I would love it if you could make this with the water count on top of it like the weekly planner has. I printed this out immediately and got out my dry erase markers to plan my day tomorrow! Thank you! WOW! This is FANTASTIC! Thank you so much for taking the time to make and then share these with us! I especially love your daily to do list with schedule!! I agree with JennyC, I would love to see the water count on the top as well. Thanks for blessing us! I love your printables! They are a HUGE help in my current efforts to organize our bills! Thank you so much! I literally have searched every site and pinterest for days on how to build a home management binder. Your site is by FAR the best and thank you for not making me pay $45 like most sites to access their printables (I too could kiss you)!! I love buying things like these but I have a hard time actually using them. That is my goal…to actually use it! I have bought all the supplies. Here is my question: How and WHEN do you fill out your monthly and daily to do list with the time schedule. This is what I am having a hard time understanding. Do you fill out a daily one every night? Do you dedicate Sunday to filling out the daily ones for the upcoming week? Thanks! Also, when you use sheet protectors, does the marker ever rub off? Thank you, Jenny! I appreciate the compliment! As far as your question, since I am a list person, yes, I fill out my daily to do list every day. I like to fill it out first thing in the morning. If I start thinking too much before I go to bed, I won’t go to bed. 😉 I printed several to do lists for my binder and only erase them every three days. That way, if I need to refer to notes or things I didn’t get to on the previous days, they are easily accessible. You could print out 7 and plan out the whole week if you prefer. I have found that three days works best for me. As far as the markers, I HIGHLY recommend Staedtler Lumocolor non-permanent pens. They are a wet-erase pen that doesn’t smudge or accidentally erase. Simply use a damp paper towel to wipe your page clean when you are ready to. They are slighly more expensive that what I have found at Walmart or office supply stores, but in my opinion, they are worth it! Incredibly generous! I make my own binder system and have for years so I appreciate how many hours go into the planning. And your are much prettier 😉 many thanks for sharing these! I love this! I am a huge planner junkie and I am always looking for new ways to plan my day. This looks great–can’t wait to give it a try! Thank you, Thank you, Thank you! I am also a home schooling mom, that is heavy into volunteer work at our church and needs organization. This is much better than what I was using before! Love all of your info and tips! My family is loving this new system as well! Thank you so much for sharing your talent and passion! Blessings to you and your family! Ginny, Thanks so much for posting this!! Love the organization!! I printed the sheet out and wrote on it but I find that my handwriting makes the pages look horrible. Do you sell the editable version on etsy or anything? This way I can TYPE my notes and to do. LOL, thanks!! Happy New Year! Do you use your planner at home only? Or do you take it with you places? This is a whole new thing for me but, I want to try it soon. Thank you! These printable are excellent! Thanks so much for sharing them! Any tips for printing these in a half page size? I really want to print and laminate them to fit in my day planner. Thank You for making your printables free. I am being treated for Fibromyalgia and at the moment I don’t have a reliable support system, I think my family is beginning to understand, but they still don’t help out. Your printables are a God send, I realize that the more organized my life is, the easier it gets for me to function, especially during my flare ups….Thank You!! Thank you so much for these free pintables!!! I am starting a home planner and while I have big goals, I’ve never used a planner and didn’t want to spend a lot of money on it until I know I would use it. I hope to visit your “editable” pages next year. Hi Ginny. I’m new to your site and I LOVE IT!!! Holy cow! I also bought a new printer (that prints color!) so I’m even MORE excited to print everything out! I love the name of your blog and why it isn’t the word organizED, I love that you love Jesus! I am so happy that you have this website. THANK YOU for all that you do! I’m so happy! I’m so blessed because of your creativity! Thank you!